The Head of Chambers is responsible for the overall affairs of Rahman’s Chambers in its entirety, whether it is legal issues, management affair, client handling etc. Out of our 9 (Nine) Practice Departments comprising 26 practice areas, being the most senior and experienced member of the Chambers, he heads a majority of them. The departments, which are headed by other senior members, he oversees and assesses the work and remains ultimately responsible. The Head of Chambers oversees the management assisted by the coordinator and attache'(s) of branches and experienced management staffs. 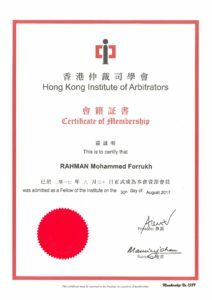 Mr. Mohammed Forrukh Rahman, LLB (Lond), is a Barrister of Hon’ble Society of Lincoln’s Inn, London and Advocate, Supreme Court of Bangladesh. He was called to the Bar by Hon’ble Society of Lincoln’s Inn in 2003 after successful completion of Bar Vocation Course from the College of Law, (now the University of Law) Bloomsbury, London. Mr. Rahman completed his internship from reputed Lee, Khan and Partners (now dissolved) in 2004 on banking and corporate law and pupillage on banking, commercial and corporate Litigation with Mr. Ajmalul Hossain QC. He worked for A Hossain & Associates, Dhaka office under Mr. Hossain QC for nearly 4 years as an associate. In 2006 he joined his family law practice, originally commenced by his grandfather in 1920s followed by his father, under a new name and title of Rahman’s Chambers. He has altogether 15 years’ background of working in the field of corporate & finance, shipping and dispute resolution. For the last 12 years, he leads the firm, Rahman’s Chambers, which has its own independent standing and now a leading law firm in the field of Corporate & Finance and Shipping. 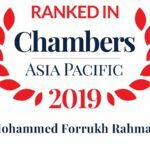 Mr. Rahman is one of the leading practitioner in Bangladesh, ranked by Chambers Global and Chambers Asia Pacific in the field of Corporate, finance, Shipping, dispute resolution and international works involving both for contentions and non contentious matters. In 2018 advised Bunge S. A., Switzerland involving claim for hire by disponent owner in relation to cargo discharged in Bangladesh on different aspect of applicability of local arbitration laws in an international arbitration pending in LMAA. In 2018 advised MAN Industries (India) Ltd. of India involving disputes over issuance and acceptable of notification of award in an international tender for supply of steel leading to Singapore International Arbitration Center (SIAC). Represented UK P&I Club and the owner of M.V. SUPRAMAX VIVI in a collusion matter which took place in Bangladesh but the Parties chose Singapore are a forum and decided not to appear before Bangladesh Courts. As Bangladesh counsel we worked together with HFW, an international law firm and were actively involved in advising, drafting petition based on private international law principles challenging the jurisdiction of Singapore. As a lead counsel, successfully advised and assisted Oriental Container Line regarding the takeover of the company by another OOCL entity; a Hong Kong-based company as a part of a global takeover. Advised A.P. Moller Maersk Line head office over issues involving shipment and foreign exchange control regulation, effective cargo discharge regulation. This assisted in framing new policy affecting Bangladesh, India, Pakistan and the countries who have similar FOREX regulation. he is a knowledgeable and very co-operative person. I have discussed many issues with him and he gives me the right suggestions. 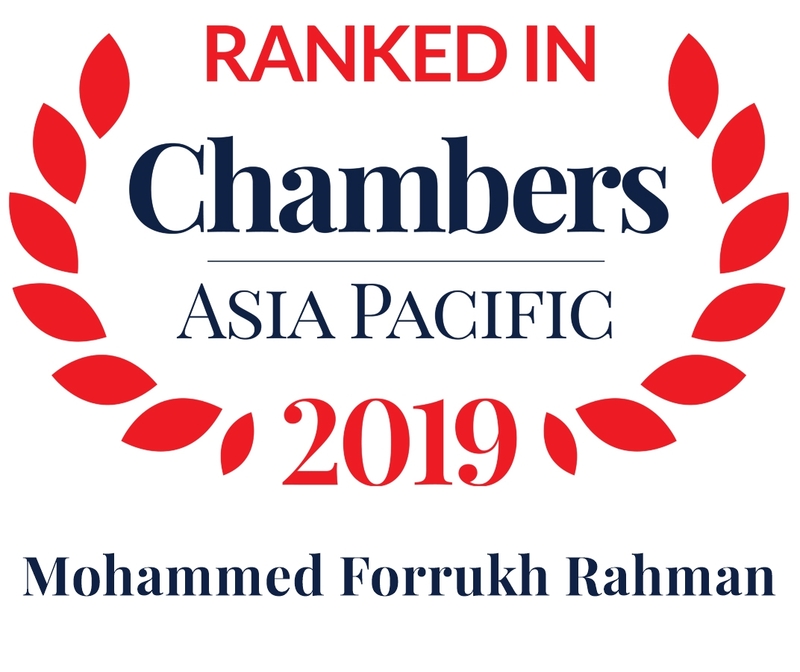 – Ranked (Band II) for Corporate and Finance by Chambers & Partners 2019. Successfully conducted hearing of writ petition involving gas line connection related disputes through dedicated line 150 psi 12- inch gas line for TM Textiles and Garments Ltd reported in 6 CLR (HCD) (2018) 65,70 DLR (2018) 409. Winding up of United Airways (BD) LTD, on behalf of major Canadian engine supplier in an attempt to recover leased engine and outstanding rental and MI Industries (India) Pvt. LTD over bankruptcy matter. Successfully conducted hearing of Income Tax reference disputes between Grameen Danone Foods Ltd vs Commissioner of Taxes reported in 6 CLR (HCD) (2018) 25. Appeared for central bank from 2008 till 2015 on various complex banking litigation issues and also acted as counsel over various major complex banking litigation involving a local and cross-border transaction. Successfully conducted hearing involving VAT related ADR between Grameen Danone Foods Ltd vs. Customs, Excise and VAT Authorities (ADR from Appellate Tribunal. As a team leader assisted in one stop business setup service providing to Surjin Tech Co., Ltd. Client initially instructed to conduct due diligence on a comparison of the available incentive of setting up business in EPZ, SEZ, Hi-Tech or other geographically located areas in different divisions of Bangladesh. The client also conducted due diligence on different incentive available for different business sectors, e.g., Industrial, IT, Infrastructure, etc. Finally, we assisted the client in business setup process and acquisition of land. Acted as a lead counsel for Unitex LP Gas Limited involving design, supply of equipment, project management, supervision, erection and commissioning of liquefied petroleum gas (LPG) terminal plant and bottling facilities at Chittagong. We advised clients from the very inception of the project starting with project due diligence, framework agreement, EPC and other related contract drafting. Advised different companies at different stages of the project starting from due diligence of land, taxation and company matter leading to bidding, unsolicited proposal, negotiation of contract based on PPP model or not for China Petroleum Pipeline Construction Bureau (CPP) in a deep sea pipeline construction project, Union Resources on 1320 MW coal-fired Power plant project and NTPC on a major 1320(2 x 660) MW coal-fired power project on PPPbasis at Rampal. He also advised EPC contractor notably NEPC in recent years on several issues. Takeover of an OOCL company as part of a global takeover, Corporate reorganization of a major leather company and a major foreign investment company in garments and textiles sector among its shareholders. Was involved in a number of major syndications, project finance transactions for City Bank Ltd and drafting of several laws, circulars, regulation and guidelines for Central bank. Advised Power Cell over procurement matters, drafting PPA, LLA, IA etc for small IPP, IPP and rental projects while he was acting as a Legal Consultant on a fulltime basis for Power Cell, Power Division from 2007 to 2008. Successfully argued in the mater of documentary fraud on behalf of importer ‘Saturn Textiles Ltd.’ involving the supply of defective fabrics, raw material of RMG, by filing suit in lower court and also higher court and were able to obtain an injunction on payment under Letter of Credit on the ground of fraud in 2013. Successfully representedHossain Dyeing and Printing Mills Limited, a concern of Anwar Group of Industries in the recovery of the claim for delivery of fabrics under sales contract where payment has been illegally refused by LC opening Bank and later by the buyer under the sales contract. Recently, the Hon’ble Court passed judgment and Order in favor of our client decreeing monetary payment against the buyer after years of battle in Court. Successfully argued in the matter of Freight and Charges involving Maersk Bangladesh Limited vs Bangladesh reported in 4CLC(HCD)79. Successfully argued in the matter of LC Fraud (Hallmark case) Alvi Spinning Mills Ltd and others vs Govt. of Bangladesh reported in 19 MLR(HCD)277. Advised Maersk Bangladesh Limited and also A.P. Moller –Maersk, Denmark by preparing templates for Letter of indemnity suitable for Bangladesh and also other jurisdiction, for example, India, Pakistan where there exist foreign exchange control regulation. Conducted due diligence over customs duties etc. on specific products for VVD, India and Godrej, India. We can therefore highly recommend the legal services of Mr. Rahman to any party, which needs legal support in Bangladesh in matters relating to international trade, financing and transport. We were impressed with the expertise and knowledge of Mr. Mohammed Forrukh Rahman in particular with international arbitration on maritime matters. Mr. Mohammed Forrukh Rahman is a pleasure to work with as he is highly competent and knows the intricacies of the matter on hand. His fast and clear responses to our queries, even on unholy hours, assure us that our claim is being handled with such meticulousness that bridge the gap between the continents.. In a sensational matter, widely covered in news media, involving eviction of property located in a prime location of Dhaka between Moosa Bin Shamsher vs. Ayub Ali & Others reported in 2 LNJ (2013) 18 etc., Mr. Rahman successfully argued before Hon’ble court and finally were able to assist client in recovering its possession. Successfully argued in the matter of Insurance Claim between Abdul Jalil vs Artha Rin Adalat reported in 67 DLR 475. Appeared as a counsel in an banking related arbitration between IDCOL and several other borrowers. Panel lawyer, several banks and financial institutions and others. Bangladesh Bank Order ( amendment) 2009, Bank Company Ain (amendment) Draft 2009, Financial Institutions Act (Draft) (amendment) 2009 and its translation. “Crisis time drafting of commercial contracts” titled Article was published in The Daily Star. “Judicial Intervention in Administrative Action: Bangladesh Bank Perspective” titled Article was published in The Daily Star. “Preventing money laundering What should be the mechanism?” titled Article was published in The Daily Star. “Common International Trade Disputes in Bangladesh” titled Article was published in the BIAC Fifth Anniversary Souvenir. “Construction and Engineering Related disputes in Bangladesh” titled Article was published in the BIAC Quarterly Bulletin 2017. “Power Sector Related Arbitration in Bangladesh” titled Article was published in the BIAC’s 6th Anniversary Souvenir. Higher Secondary Certificate (HSC), Dhaka College, Dhaka. Secondary School Certificate (SSC), Dhaka Residential Model College, Dhaka. Recommended by Seapower Shipping for maritime claims. Recommended by Komrowski Maritim for international arbitration. Ex trainee, Lee, Khan & Partners (2004). Appointment/teleconference etc. in special circumstances may be possible apart from the regular consulting hours.